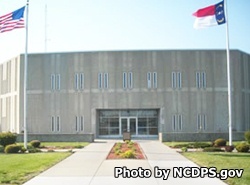 Located in Elizabeth City North Carolina, Pasquotank Correctional Institution is a close custody facility that houses 896 adult males. Inmates are housed separately according to their security classification. Minimum custody inmates at Pasquotank Correctional Institution can work on community work squads, on road cleanup crews, and for county recycling. Additional on site work opportunities for inmates include kitchen, custodial, and maintenance duties. This institution is secured by a razor wire fence with an electronic detection system, and armed patrol. Inmates at Pasquotank Correctional Institution can obtain an adult basic education and earn a GED. Mental health services, recreation, medical and dental services are also available to inmates. Additional programs are available and include vocational training and substance abuse treatment. Inmates at Pasquotank Correctional Institution are allowed a maximum of three visitors per visit. Minimum custody inmates with a last name that starts A-M have visiting on Saturdays from 12:30pm-3:30pm, inmates with a last name that starts N-Z have visiting on Sundays from 12:30pm-3:30pm. Close custody inmates have visits Sunday-Thursday by appointment only that must be scheduled at least three days in advance by calling (252)-331-4765.